Spruce up your home with this rounded heart set atop cross bones and inscribed with Woof.” offering a playful and convenient way to hang your pet’s leash. This leash hook is handcrafted and made with lead-free pewter. 2 3/4″ H x 2″ W. Made in the U.S.A. 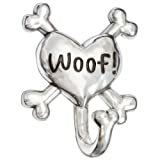 This entry was posted in Dogs and tagged Doggie, Hook, Leash, Pewter, Rockin', Woof/Heart/Crossbones by One Boutique. Bookmark the permalink.